If John Wilson had been eligible to follow his first passion and had been able to study history at university in Scotland, would he have ended up in Canada writing books for the nation's children and adolescents? "When I go to schools, the kids all want me to say that I wanted to be a writer when I was growing up. I never did. In those days in Scotland, 'creative' writing wasn't encouraged. I did a lot of writing at school, but it was essays on things like the Romans in Britain. The subjects that interested me were history and, to a lesser degree, English, especially the historical aspects like Shakespeare and Chaucer. At one time, I thought I'd actually do history at university, but I couldn't because it was an Arts degree. I needed a higher French qualification for entrance, and there was no way I could've ever got that. I thought of archeology, a science, but there was no archaeology in universities in Scotland. Then I moved a step back to geology, but for the same reason: I wanted to know what the past was like. When I was a kid, I was interested in dinosaurs, and I'd go out collecting fossils. When you hold a fossil, you're holding something that was living on the seashore two hundred million years ago, and that gave me a thrill. It told me something about what that seashore was like. It's what attracted me to geology, and it's also why eventually I got out of geology. I ended up looking for oil or uranium for somebody. If the work I was doing didn't produce a profit in six months or a year, then you stopped. That's not at all what I wanted to do." Born on August 2, 1951, in Edinborough, Scotland, John lived there for only four months before the family moved up to the north of Skye where his father ran a hotel for about four years. "My dad was an engineer, and so, after the Skye experience, he got a job on Clydeside in Glasgow. We moved around a lot. We lived in Glasgow for a little while, then outside Glasgow, and finally we moved to Paisley. Because I spent my youth in Glasgow and Paisley, I've always regarding myself as a city boy, and yet there was a part of me that was never happy there. That's the part of me that goes back to Skye where, for instance, everybody spoke Gaelic and had the soft lilting highland accent that you hear in the movies. Apparently, I did have the accent and spoke a little Gaelic, but I don't have either anymore. It's difficult to say why I feel this way because there's nothing I can put my finger on that allows me to say specifically I'm this way because of Skye. It's just a general feeling that more of me goes back to there than I had thought until recently. I loved living on the prairies, but I missed the ocean terribly. Now, I'm back living on an island beside the water in a little village just north of Nanaimo on Vancouver Island." John did go on to university, earning an Hon. B.Sc. in Geology from the University of St. Andrews. "When I graduated in 1974, there was no work in Britain, and so I went to Zimbabwe (or Rhodesia as it was then) because they were crying out for geologists. When I got there, I realized that their need was because every able-bodied male was in the army as the civil war was just beginning to heat up. I had two years before being eligible to be called up, and I stayed for 23 months. It was a fascinating time, but, when I think back on it, I was out of my mind going there. I went thinking I had nothing in common with Ian Smith's UDI government, and I didn't, but I went into a situation where I met people who were diametrically opposed to me, philosophically and politically. They came from such a completely different world and background, growing up in Africa and being fourth-fifth generation settlers. They had perspectives on the world that I thought were absolutely horrendous, and yet they were people that I really liked. It made me think that humankind is a lot more complicated than we often give it credit for. If I'd worked in Britain or come straight to Canada, I would never have experienced that, and I'd have been much more locked in my thinking and much less flexible in my relationships with other people who are different." "I worked mapping metamorphic rocks for the Geological Survey in Rhodesia. I'd done my degree in sedimentary geology, but the Survey was so desperate they didn't care. When the fieldwork season started, I was given a Land Rover, a caravan, maps and air photos, and sent off. Looking at the air photos, I found a place close by that had a lot of good rocks exposed. On the first day, I walked out there with my field assistants, and there were all these green rocks. It was horrible. I didn't have a clue what the names of them were. By about noon, I was in tears. 'What am I going to do? I've got to map hundreds of square kilometers, and I don't know what I'm doing. Green rock A, Green rock B, Green rock C.' Eventually, I got the hang of it." The civil war brought an element of risk into John's work. "In an intellectual sort of way, you knew you're in danger, but you were distanced from it, and so you did what made sense. For instance, when I was doing fieldwork, I'd go out early in the morning and finish early because dusk was when the terrorist attacks happened. I carried an old .303 rifle which, fortunately, I never had to use. You were just careful. You didn't drive on dirt rods because of landmines and drove in convoys into town. I stayed in farms, and, towards the end, I was living in the farmhouses with anti-grenade netting around the house because the caravan was too easy to attack. Afterwards, when I went back to Britain, people would ask, 'Why in earth did you stay there?' but you just did it. Only later did I realize how it had affected me. For example, for a long time I was really nervous sitting in a room at night with the curtains open because, in Rhodesia, it was beaten into you: 'Don't do that. Somebody can see in, and you can't see out.'" "One of the reasons my wife and I went to Rhodesia was that one of my sisters was there. When it came time to leave Rhodesia, we considered Australia because I also have another sister there, but we couldn't because Australia was really clamped down then. Canada was another possibility because I had a sister on Vancouver Island. While in Rhodesia, we applied to come to Canada and had to go through the consul in Johannesburg. At that time, there was talk of moving the white population out of Rhodesia and setting up a colony in California. Then some idiot mentioned a colony in the remote wilds of British Columbia, and I guess the idea was taken seriously in some circles because Trudeau made his speech about not accepting any white racists in Canada. Consequently, we got a polite letter from the consul saying that they couldn't proceed any further with our application. As a result, in the summer of 1977, we had to go back to Britain to reapply to come to Canada." "On the points system, we were two points short for our age and qualifications, and the immigration people in Scotland said, 'If you get your sister to write a letter saying that she'll look after you if you fall on hard times, we'll give you three points. That'll take you over, and you can go.' I wrote my sister who provided the letter, but then the immigration people said, 'There's just one catch. You have to go and live with her.' In fact, you don't, but in the fall of 1977 we arrived and got the train across Canada. My sister lived in Courtney on Vancouver Island, and there's nothing in Courtney for anybody, let alone a geologist, to do in the winter. It's a summer town, and so we spent a fairly miserably winter. In the beginning of March in 1978, I got on the train to Calgary and walked down Eighth Avenue and got a job consulting. I think it's ridiculous that somebody who'd been working on 'green rocks' in Africa just a year before could become a consultant in Calgary, but that's what you could do then." "In 1979, we moved up to Edmonton because I got a job doing survey work with the Geological Survey of Alberta doing what I wanted to do, finding out what the past was like. I worked there until the end of 1986 when we took a year off and travelled around the world. And that experience spoils you for a lot of things, one of which is working for a government agency in Edmonton. Consequently, we were dissatisfied when we came back at the end of '87, and then my first kid showed up shortly after, and that's another event which changes your life perspective. Because there were layoffs all over the place, I 'volunteered' to be laid-off, just to get my separation package, but there weren't any layoffs that year. So, I had to quit, and then I started writing." "One of the motivations for the year's travel was to go to India where my parents had been born and lived. Both sides of my family were what used to be called 'Indian families.' In those days, 'English' children were sent back to Britain for their education and then sent back out to India. My dad came back to boarding school, and my mom was sent back to Britain to be trained to do things like handling servants and holding dinner parties. My dad did his apprenticeship in Clydeside in the early Twenties and then went back out to India to work. At 18, my mom was sent out at the beginning of the 'season' with the boatloads of eligible young women who, basically, were being sent out to find a husband. A terribly cynical approach, but that's the way it worked in that kind of society. Mom met my dad, and they got married. My sisters were born in India in the Thirties. I was very much an afterthought. My oldest sister was 20 years older than me, a big spread, and, when I was born, the closest surviving sister was still 14 years older than me. In 1939, my mother brought all my sisters back to Britain, and they got caught there by the Second World War with my dad still out in India." "After the war, because it was obvious that India was going to get independence fairly soon, there was no point to my sisters going back out. My dad came back to Britain in 1949, and I was born in '51. Growing up in the Fifties in Britain was not a lot of fun. I still have my ration card. Mom hated it because she was used to living this life in India with servants. She thought, 'Why in earth would anyone want to stay in Britain? It was a terrible place. You have got to go somewhere. Go out to the Empire' (except there was no empire left). All my sisters left home in the Fifties and went overseas. Consequently, I grew up with the expectation that, as soon as I was able, I, too, would leave Britain. Where didn't matter. It's only relatively recently that I realized I didn't need to leave. I could have stayed, but it's funny how these things affect you at the time. You don't question them." After returning from his '86-'87 round-the-world trip, John decided to try to make a living by writing. "When we were traveling, I consciously took a lot of photographs, two and a half thousand, with the idea of selling them afterwards, writing travel articles and things like that. I'd already done a lot of writing, but it was all technical writing, bulletins and scientific papers. I gradually started, selling a piece to the Globe and Mail and another to Canadian Airlines' In Flight magazine. My thinking was, 'I'll give it a try for a year because, after a year, I can probably still get back into geology.' So I freelanced and did some geological consulting as well which eased the transition. Then, without really sitting down at the end of the year and asking, 'Is this working or not?' I kept on doing it, assuming that I'd always write fairly concrete stuff - travel and popular science articles, some technical freelance writing. I never assumed I'd do any other kind of writing, but then it develops a life of its own." "Looking back, it looks a bit like it was planned, but none of it was. It just happened. At the time, it seems like a good idea. You feel an urge to write a poem, and so you write one. Then it wins a competition, and you get a hundred bucks for it, and somebody publishes it. Suddenly, you're a poet. You write children's stories, and Chickadee publishes them, and suddenly you're a children's writer. As a freelancer, you have this eternal dilemma that you're always working on the next article, and you never get ahead. You're paid one sum for an article, and you have to continually keep up this output to make a living. You can make a reasonable one, but you can't take time off from doing that to write something longer which ultimately, with royalties, might produce some kind of stability in your life." "My first book, Weet was originally a short story that everybody rejected because there was too much 'introduction' to the story and then it just stopped. I set it up as five chapters, chopped off the end and sent it to Napoleon (whose name I just randomly picked out a magazine), saying, 'This is the beginning of a longer book..' After not hearing anything for months and months, suddenly I got a letter back announcing, 'We liked the first five chapters. Can we see the rest of the book?' Small problem - there was no 'rest of the book.' I hadn't done a thing to it in the interim,. I called Napoleon who gave me two months. I wrote Weet in six weeks in 1991 and sent it to them, but it wasn't published until 1995. It was a slow business. At that time, Napoleon was just starting out, and they were very small and only doing a couple of books a year." 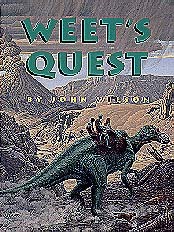 John explains that the Weet character had its genesis in the work of a Canadian palaeontologist, Dale Russell, who conjectured, "What would have happened if the dinosaur hadn't died out?" "Obviously, 'we' wouldn't be around, but dinosaurs would have evolved in the 65 million years, and so Russell asked himself, 'What would they have evolved into?' He took a small, fast running, relatively intelligent dinosaur, Troodon, and speculated that it might have evolved into the Weet character that I used. I saw a life-size model of Russell's humanoid dinosaur in the Tyrrell museum, and the only thing I added was the assumption that the dinosaurs had evolved into this guy before they died out and we've just not discovered his bones. There must be tens of thousands of dinosaurs we don't know anything about at all, and so why not Weet? That was the basic idea, but then comes the problem: if you're going to have people and dinosaurs together, either you bring the dinosaurs into the present à la Jurassic Park, or you take the people back into the past. I chose to use the time travel idea." "Then, while I was waiting for Weet to come out, I thought, 'I've got to write a sequel.' I wrote Weet's Quest about '94, and it didn't come out until '97. At that point, I was balancing both writing novels and freelancing, and I managed to keep them both going. Now I do very little freelancing, just the occasional piece as well as fairly regular book reviews for Quill and Quire." According to John, the Weet books did not demand a lot of additional research. "I used a lot of my geological background. Because Weet's set in southern Alberta, I knew the geology fairly well although I hadn't worked on it, but I'd been on field trips. As well, I had the interest in dinosaurs, and I did a bit of research into the latest theories of what the dinosaurs looked like." "When I was in a panic thinking over the rest of Weet after Napoleon called, I had an idea that I thought might work, but I didn't use it in Weet. I thought, 'I'll use it in the sequel,' and then I started writing Weet's Quest, and it sort of developed on its own and I never used it. And I didn't in Weet Alone, the third one, because obviously that's the end of the Cretacious period, and so that story has to be centered around the meteorite impact. I still have the idea and may write another Weet book set in the present. Because the trilogy's complete, it won't be a continuation, but it would have the two children and be centered around Weet's bones. 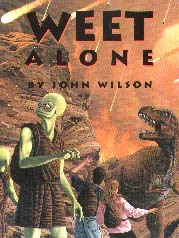 At the end of Weet, the children find his bones, but nothing else happens in the other two Weet books about them. They're still sitting there in a hoodoo in Drumheller, and , if they were dug out, they would be incredibly valuable. At the moment, the idea involves building a modern day mystery story around what could happen to Weet's bones once they are excavated. The plot would involve the kids and include references to the past and maybe even have Weet's voice coming in. It's going to be a couple of years before I have any time to do it." "Across Frozen Seas started again with my interests. When I was about nine, I went on holidays with my parents to an island off the coast of Scotland. It rained the whole time (not an unusual occurrence), and so we were stuck in a lot of the time. It was a bed and breakfast place, and there wasn't much to do, but they had these old books in the front room. I read a whole bunch of them including Robert Falcon Scott's Journals, the edition that was sanitized by his wife after he died, and I was just enthralled. Here's this guy dying, and yet he's talking to me. I always loved that, and I think that got me interested in that kind of setting -explorers who go off and die mysteriously. I read all this stuff - about Franklin, Shackleton, and Amundsen, all the people, north or south, it didn't matter. I read about Livingstone and African explorers too. What always attracted me was the idea of somebody going somewhere different, and then their being in this situation where they don't have control. If they happen to die, so much the better. The danger adds the extra element of excitement to it. A lot of the British stories I grew up with in the Fifties always had happy endings, and the hero didn't die. To read about Franklin and to have the hero die is a very powerful thing for a kid because most cultures protect children from death." "Basically, with the Across Frozen Seas kind of story, as an author you have three options. I didn't want to do time travel again because I'd done that with the Weet books. You can write the story in the past, something I didn't want to do because I wanted there to be a modern component, a contemporary boy having some kind of relationship with the Franklin expedition, to make it relevant. Given that, then you could have him find a journal which I considered, but the problem is that the story takes place over four years. How do you do a journal? For 10 months of the year, they're trapped in the ice. It was boring to live; it was boring to write about. I discarded the journal approach and then thought of dreams. The dream idea developed as I was writing because I liked the idea of being able to tell stories alternately. Other possibilities developed: he's not just dreaming about this character. He is this character in the dreams so that, at the end, the dreams can become so vivid that he can't tell the difference and thinks he's going crazy. In the book, the dreams are written in the present tense, and the present day is written in the past tense to make the dreams appear vivid to the reader. There was no particular reason for setting the contemporary portion in Saskatchewan. I wanted to be close to a relatively big town because Dave had to go into town to see the therapist. I didn't want to use Alberta because I'd set Weet there, and so I just moved a province over and noticed Humboldt. The name attracted me because it's named after an explorer. 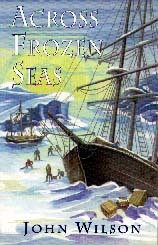 Oddly, the manuscript for Across Frozen Seas was turned down by one publisher because they felt everyone dying 'was too grim' which, of course, is ridiculous since 'too grim' is an oxymoron for grade 7-8 readers." 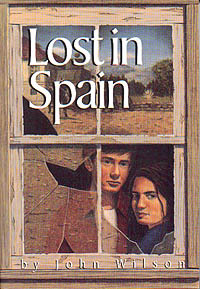 Lost in Spain was also written because of John's personal interest in the subject area. "The Spanish Civil War has always been an interest of mine. My mother was a great one for saying, 'You'll grow out of it,' and, when I was a young teenager, there were three things that she always said that about. One was atheism. At about 13 or 14, I'd decided I was an atheist, didn't believe in God and wasn't going to be confirmed in the Church of England. 'It's a phase you're going through,' said my mother. The second was an interest in Bob Dylan, and the third, an interest in the Spanish Civil War. The last two both involved this consuming passion that you only have when you're 14 and you're a lonely shy kid anyway." " I started marketing that manuscript myself, and it was turned down. I got two very interesting rejections. Somebody rejected it because it was 'too old fashioned' which, for an historical novel, should have been a compliment. Apparently not. Somebody else turned it down because 'it didn't have enough Canadian content.' Obviously, Franco should have besieged Winnipeg instead of Madrid in 1936. That was a big mistake on his part! Then Melanie Colbert, who's now my agent, took it over, and she interested Gail Winskell at Fitzhenry&Whiteside." "With Lost in Spain, there's no time travel or anything. Set in 1936, it's told through the eyes of the main protagonist, a 14-year-old Canadian boy, Ted Ryan, whose father, Will, is a socialist in the Okanagan Valley during the Depression. Coming into some money, the family goes on holiday to Europe where the boy gets caught up in the outbreak of the Spanish Civil War in July of 1936. They're in the south of France when the revolt breaks out. Ted's father decides that he's going to go to Spain on his own for a week to have a look around because he thinks it might be the beginning of a much wider war and the people in Canada are going to have to know what's going on. After Will leaves, Ted and his mother, Catherine, get caught up in a riot in Perpignan where Catherine's hit in the head and goes into a coma. Ted doesn't have any contacts or money, but, through talking to a medical student at the hospital, Ted gets the idea of going to Barcelona to find his father and bring him back. In Spain, Ted gets caught up with all the anarchist collective and the fighting outside Zaragoza and the Aragon Front that Orwell was involved in. A lot of the research was backgrounded from Orwell's Homage to Catalonia which happened a few months later but in the same setting. Ted meets a Spanish girl, Delores, the daughter of Will's Barcelona contact, and together they go looking for Will. They get caught up in a Fascist advance and have lots of adventures." Lost in Spain's actually a very political book. It's impossible to write about that location and time period without being political. And I wanted to write a political book. I wanted the kids who read it to be aware that there are alternatives, and radical alternatives, not what their parents talk about, the NDP, the Liberals, the Reform and so on. There was a time for a few months in a certain area of Spain where the ideal of anarchy as a philosophy and as a way of life was practiced." John has authored another "political" book, this one nonfiction. "It's a biography of Norman Bethune, and you can't write about Bethune without the book's being political. It's the first in 'The Quest Library,' a series aimed at high school students. The series idea came from André Vanasse at Quebec's XYZ. They do a series of Quebec heroes, but, rather than translating the French ones (many of whom we've never heard of), André wanted an equivalent series with English heroes. He got Rhonda Bailey to edit the English titles, and she contacted authors, asking, 'Who would you like to do?' After looking around, I decided on Norman Bethune. He turned out to be a great choice because he had such a fascinating life. To write Norman Bethune's life in 30,000 words, the problem's not finding stuff to put in; it's what to leave out." "I would find it terribly difficult to write a biography of someone like Terry Fox. He was essentially an ordinary guy who died young and did one extraordinary thing. I would find it too daunting to write an entire book about that and maintain a high level of interest. So I'm doing a biography of John Franklin. He had a very interesting life, and, after all, I've already done much of the research. I'm also working on another Bethune book for Napoleon, a biography for elementary school kids. As well, I've just completed another historical fiction for young adults.. This one's on Henry Hudson and what might have happened to him and his son after they were cast adrift in James Bay in 1611. Again, there's a modern element, but it's not going to be dreams. It's more the time travel kind of thing but not in the same sense of Weet." "Without mentioning any editors or publishing houses by name, one of the things I've discovered in writing for juveniles is that there is a desire to dumb-down the language. According to these people, if the book's written for 9 to12-year-olds, and if you want nine-year-olds to read it, then here's the vocabulary that nine-year-olds understand, and here's the sentence structure that average nine-year-olds in the school system can handle. There's a perception that a book for nine-year-olds should be written using only that vocabulary and sentence structure. I think that's ridiculous because it becomes a self-fulfilling prophecy. Nine-year-olds should be reading stuff for 12-year-olds. They should be pushed, not ridiculously far, but they should always be stretching to get the next bit. There should be words they don't understand. I'm not one of those people who say that kids should read a book with a dictionary beside them, but they should be able to get a sense of the word from the context and the sound of the word. They should be pushed with sentence structure too. Not all the time, but occasionally they should be getting longer sentences that they have to work at. The excitement should be enough to carry them through. With various editors, I've had not fights, but disagreement, about level. When I was a kid, I read most amazing stuff because I was interested. If the plot is good and strong and the subject matter is interesting, you'll draw the kids through the books, and that's one of the most difficult things to do - get the kid to read the book and get all the way through to the end." In reflecting on his approach to writing, John says, "I've learned discipline. I never realized how much discipline was going to be required of me when I started writing. As an occupation, it's been good in that I've had a lot of flexibility over the last 10 years when the kids were young. The youngest, who's just turned six, is now in school and on the same schedule as his sister and that frees me up a bit. A large part of becoming a writer was working out when I write best and working out what was the most natural rhythm for me to get into. I write best in the mornings, and so I get up and write. After lunch, I'm not good for anything. I can do bit of editing, filing or catching up on my correspondence, and then I have another burst from 3-5 in the afternoon, which I don't always get if my wife's working. Then, I bring the kids home from school and look after them. The flexibility's been a big plus and has, in some sense, made up for the lack of money. My wife's a family therapist, and so she's also self-employed. If the kids are suddenly ill, it's much easier for me to take care of them because my wife would have to cancel clients and change her schedule. Plus, she's paid for each hour she works; I may not be. It's fairly obviously really who's going to take care of the children." "I write very quickly. North With Franklin, my 'adult' book, is 120,000 words, four times the length of the YA novels, and I wrote that in three or four months. I can write so quickly because I'm writing about subjects I know about, usually very, very well. Additionally, I do a lot of the background reading beforehand, and, finally, I do a lot of thinking about the book before I start writing. I teach courses in writing and tell people, 'Don't edit as you write,' because, for a lot of people, it doesn't work. But, for me, it does. I'll write a chapter and then go back and read through it to get back into the voice or whatever to continue the story. And I can't do that without editing. On a small scale, I'll edit typos and spelling mistakes, but also I'm thinking, 'This would be better if it went there,' and I cut and paste. I do the whole editing thing over and over again because, while I'm writing the book, I may read that chapter 20 times. Consequently, when I finish the book, it's already been reworked a whole bunch of times. Usually it goes through one rewrite after it's gone to the publisher and a bunch of small scale edits." North With Franklin, came about because of Across Frozen Seas. "When I was writing Seas, I came on a journal written by James Fitzjames, Captain of the Erebus and the third in command. He wrote this journal in the form of a long letter, about 7,000 words, to the wife of his cousin and sent it back to her from Greenland when they stopped to pick up supplies. The letter was published in a sanitized version in 1852 in a nautical magazine. The original's archived in Britain, and I enjoyed it very much. Fitzjames seemed like a really nice guy. Because it's a letter, it was never meant for other eyes, and it's very engagingly written which is unusual in journals for that time. Fitzjames is very cocky. He's in his thirties, and he's the kid most destined to succeed. There's no doubt that he would have been an admiral if he'd lived. I thought, 'I would have enjoyed going for a beer with Fitzjames and talking about Franklin and the Arctic. After I finished Across Frozen Seas, the idea grew in my mind that, after Greenland, Fitzjames would have kept writing his journal. It would have been written and then lost with the expedition. The idea began to form that I could recreate his journal, and I sat down and did it. It was relatively easy, again because I'd done a lot of the research, but also because it was one voice, and so you just needed to get into his voice, something I found relatively easy. When I wrote the first draft, I only focused on two things. One was keeping his voice consistent, and the second was making it historically plausible. I got a grant from the BC Arts Council and went over to Britain for a couple of weeks to the Scott Polar Research Institute in Cambridge and the National maritime Museum in Greenwich where I researched Fitzjames and his fellow officers and the stories he might have told around the mess about his time in the Opium War in China and what his fellow officers had done. I started to give them characters and to add this extra layer of character and background to the book. It's all told in journal style. I don't know if it would have a high school audience because it was never intended for that age although I've talked about and read bits of it to grade 7-9 kids. When I get stuck with a grade 8-9 class for an hour, they're way too cynical for dinosaurs, and so I do Franklin and then get into the Fitzjames thing, and there is an interest there." "While I don't particularly like it, I'm finding that I'm working on more than one thing at a time. I'd rather have project and see it through, but it's not possible at that moment. For example, in the spring of 1999, I started the YA novel on Henry Hudson book and wrote about a third of it, 10,000-12,000 words. At that time, I was going to have four books coming out in the fall of 1999, so the editing of them was a major job, especially with something like North With Franklin. I had to drop Hudson and do the editing over the summer, and then I got back to Hudson for a few weeks before I had to drop it again because I had to start the Bethune book for Napoleon and work on the Franklin Biography for XYZ. I have just recently got back to it and it was completed in May 2000. All in all, about eight weeks writing, but spread over more than a year." "When I'm talking to kids, a lot of them will say, 'Thanks for writing these books for us,' but I'm not writing the books for them at all. I'm writing for me, the me that was 12 and wanted to read those books. My only rationale is: if I would have enjoyed those books when I was 12, then presumably somebody else will too. Therefore, I don't consciously think, 'Dinosaurs or dead guys in the Arctic are good topics.' It's whatever interests me, and then I write the book and argue with the publisher about how we should do things because the marketing department comes into it." Across Frozen Seas. Beach Holme, 1997. Grades 4-8. Lost in Spain. Fitzhenry & Whiteside, 2000. 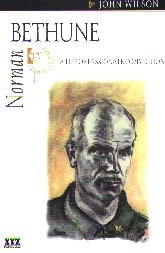 Norman Bethune: A Life of Passionate Conviction. XYZ Publishing, 1999. Grades 10 and up. 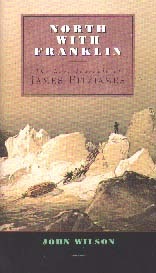 North With Franklin: The Lost Journals of James Fitzjames. Fitzhenry & Whiteside, 1999. Grades 10 and up. Weet. Napoleon Publishing, 1995. Grades 3-7. Weet Alone. Napoleon Publishing, 1999. Grades 3-7. Weet's Quest. Napoleon Publishing, 1997. Grades 3-7. This article is based on an interview conducted in Winnipeg, November 13, 1999.